Take in the atmosphere and enjoy the beautiful natural surroundings of the local forests! If this sounds like something that you would like to experience, Leamhin Lagoon Resort is the ideal accommodation for you. Leamhin Lagoon Resort, located close to Phuket Town, offers great accommodation, with complete facilities, and is a great alternative for those wishing to stay outside of the main tourist areas. 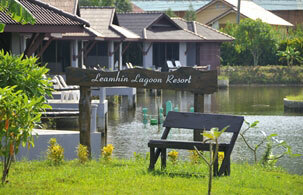 Leamhin Lagoon Restaurant is one of the freshest and affordable seafood restaurants on the island. The restaurant is renowned for its live seafood and international dishes which use only the freshest ingredients and best quality ingredients caught direct from the Andaman Sea. The restaurant is the perfect place for couples or families to enjoy a magnificent sunset combined with the sound of the sea and perfect food.